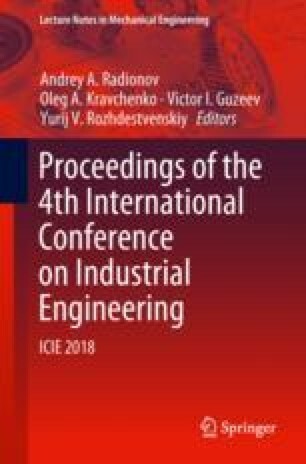 The structure, composition, and characteristics of a device for feeding a filler wire to an electron beam additive manufacturing unit are described. The analysis of the results of experimental technological processes is carried out and the relevance of considering the wire feed channel as one of the main control channels is proved, for the effective use of which feedback speeding is required. The analysis of existing methods of measuring feed speed is carried out and a noncontact measurement method based on the use of a multi-element matrix sensor and infrared illumination is proposed. A measurement scheme is described, which includes a computer, as well as a module for data collection and control. The experimentally obtained dynamic characteristics of the control channel of wire feed speed are presented. The analysis of the obtained oscillograms of the armature winding voltage and the signal of the wire feed speed is carried out, and the possibility of using the proposed sensor for constructing feed speed stabilization system is justified. This work was carried out in the National Research University «Moscow Power Engineering Institute»; it was supported by grant from the Russian Science Foundation (project 17-79-20015).